Remember I used to go Clarke Quay with my close female friends for dinner quite often, for a dinner gathering or before hitting to the high spots on Friday nights. We liked to dine in the French restaurants for their delicious spaghetti or pasta meal. Nowadays, I do not dine out so often. 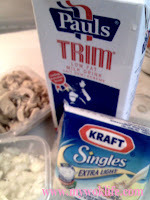 I do home-cooking, home-cooked spaghetti, with my home-made spaghetti white sauce. There is always better to cook at home than dine-out, spend at lower cost to get better quality food (Of course, it’s without crew services, and you have to wash your own utensils after cooked and plates after meal!). 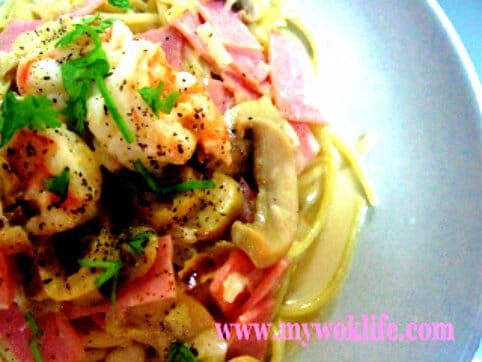 I added prawns to my ham and mushroom spaghetti. 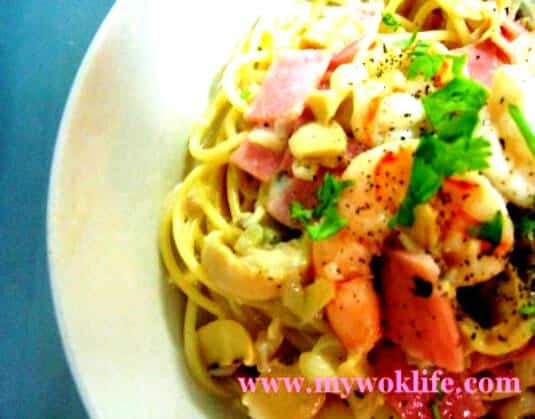 Cook this dish during weekday, after your work. It should take about 30 min to complete the cooking and to serve. 1) Bring a pot of water to a boil over medium-high heat. Add salt, and noodles. Boil noodles for 8 min, or until soften. Drain, and place in a large bowl added with olive oil. Toss briefly to mix noodles with oil. Set aside. 2) To make sauce: In a large saucepan, melt butter over medium heat. Add onion, and sauté for 1 min, or until fragrant. Add in ham and mushroom. Stir fry for 3 min. 3) Reduce heat to low fire. Beat egg yolk with milk. Gradually stir in milk mixture. Put cheddar cheese, and simmer for 2 min, until heated through. Stir all ingredients to combine well, before heat off. 4) Divide noodles in serving plates. Pour white sauce and ingredients over noodles. Garnish, and serve immediately. Tips: Boil noodles till al-dente, and not soft, if you like to have the noodles with texture or bite in the centre. *If find sauce too watery, add plain flour or cornstarch slurry to thicken it. *Taste the sauce right before heat off. Sprinkle some salt, if desired. hey pat, what milk you use? i see you put the picture of a milk called PAUL’S TRIM? any normal milk will do is it? Like HL or Marigold… etc? Yes, I used skimmed milk. It’s not necessary to use skimmed milk, fresh low fat milk is also good, regardless which brand. However, I don’t recommend HL as it tastes sweet which will affect the taste of your spaghetti sauce. Remember to keep your fire to the lowest heat when adding milk. It’s for 2-3 person… I thought I did indicate on the right top corner.. Hmm…. I shall check my website again..